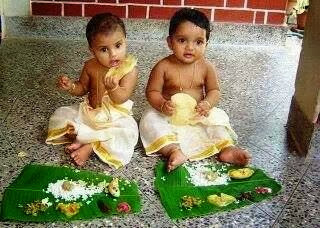 Annaprasana is also called as Rice feeding ceremony which is done when the child is ready to food habits like from Liquid food to solid food. Parents usually feed very small amount of Sweet payasam or rice. Annaprasana is the work-ship which is done to show gratefulness to the god. so the god will show mercy on parents and child to eat healthy solid food without any problem. This function is usually taking place in the 6 or 7 months on a date which is compatible to the jenma nakshatra of the child on a good and an auspicious thithi and yoga.